Duff + Phelps Had Binding Agreement With Sevco 5088. Why Did They Sell Ibrox to Sevco Scotland? 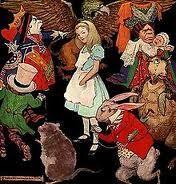 “Curiouser and curiouser,” said Alice. Despite the apposite nature of the analysis, Alice was not discussing the Rangers/Sevco situation. She could have been as it becomes ever more weird and wonderful. We are either down the rabbit hole or through the looking glass. Alice meets the panellists of a famous Scottish football phone-in programme just before she goes on air. STV today revealed that a new newco was the owner of Ibrox and Murray Park. This brought a fevered and nonsensical reaction from the “Rangers” spokesman. I wonder if Duff and Phelps or Mr Green can explain why the fixed assets were sold to a different company from the one named? What about the binding agreement? Earlier today, STV reported that ownership of Ibrox and Murray Park had passed to Sevco Scotland Limited. This appears to have upset Mr Green and his variously named consortia. My comments are in bold. IN response to a story that appeared this afternoon on the STV website, the Club has released the following statement. It is noticeable that the references are now to “the Club” issuing statements. That is even though the website it releases them on is operated by the administrators. A spokesman for The Rangers Football Club said: “Yet again, ignorant and ill-informed journalism has caused alarm to Rangers supporters. I think that the copy of How to Win Friends and Influence People which Mr Green has read was a bootleg, with the word “not” added to every sentence. That is the only explanation for the speed with which Mr Green and Sevco seem to be going out of their way to antagonise players, media and Scottish football as a whole. Calling STV ignorant and ill-informed is not calculated to be conciliatory. That is especially so when the story seems to be entirely accurate! In a survey of “Rangers” supporters, I suspect that the STV story would not be highest amongst things causing them “alarm”. “For the avoidance of doubt, Ibrox and Murray Park are the property of The Rangers Football Club, which at present is registered as Sevco Scotland Ltd until a name change is given formal approval. I suspect a legal person is behind this statement. “For the avoidance of doubt” is a phrase used commonly be lawyers, and rarely by normal people. However the legal person’s knowledge seems not to extend very far. Ibrox and Murray Park are not the property of “The Rangers Football Club”. The Rangers Football Club is not a legal entity. The Rangers Football Club cannot own property. 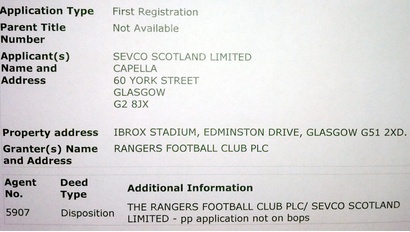 Sevco Scotland Ltd is a legal entity. It, on the documents produced by STV, owns the assets. Sevco Scotland Ltd might, in due course, change is name to The Rangers Football Club Ltd or PLC. But it can’t do so until the existing Rangers Football Club PLC is liquidated. Therefore the statement made by the “Rangers Football Club” spokesman is wrong. “Sevco Scotland was formed to ensure that if the formation of a new company was required in the event of a CVA being rejected, then the Club’s corporate entity would be a Scottish registered company as it has always been. That explanation would be ok, if not for the fact that no one bothered to mention it until the gaffe was blown by Mike Farrell of STV! Why did Mr Green not tell his supporters that he was doing this, and thus save them this alarm? I must apologise to the spokesman, but that is rubbish. People are seeing shadows because, apart from Mr Green, almost his entire organisation is in shadow, and after all that “Rangers” endured over the last year everyone, either with feelings for them or against them, will see shadows. On past form there may well still be unpleasant things lurking in the shades. What could possibly cause people to be suspicious and indeed alarmed? Let’s have a look at the CVA Proposal. Some extracts are below. 4.17 Following the extensive marketing of the Company and the extensive sale process, an offer was made by Sevco 5088 Limited (Sevco) to make a loan on certain terms (explained below) in conjunction with the purchase by Sevco of the Group Shares. 4.19 Consequently, on 12 May 2012, the Joint Administrators agreed and signed an offer letter with Sevco (the Offer Letter) and granted Sevco exclusivity to complete a takeover of the Company or a purchase of the Company‘s business and assets by 30 July 2012. Sevco made a payment of £200,000 to the Company for such exclusivity. 4.23 In the event that either this CVA is not approved, or the other Conditions of the loan are not satisfied or waived by 23 July 2012, Sevco is contractually obliged to purchase the business and assets of the Company for £5,500,000 by 30 July 2012. All further terms of that sale have been agreed in advance and are confidential. That is clear then. D&P on behalf of Rangers had a contractual and binding agreement to sell the business and assets of Rangers to Sevco 5088 Ltd if the CVA failed. On 18th May the Rangers website stated “CHARLES GREEN has revealed two of the names involved in the Sevco consortium taking over Rangers”. As we have seen Sevco = Sevco 5088 Ltd.
Charles Green, the club’s prospective owner, also told the meeting his newco entity, currently called Sevco 5088 Ltd, would be renamed The Rangers Football Club, which would be the club’s new trading name because of the death of Rangers Football Club plc. The administrators were quoted as saying the following both before and after rejection of the CVA. “As we have stated previously, there is a binding contract between ourselves as administrators and Charles Green, who is leading a consortium to acquire the Club. The creditors’ and shareholders’ meetings will take place at Ibrox on Thursday but the results of those meetings will now be entirely academic given HMRC’s decision. What was this Sevco Scotland Ltd? In any event all the discussion was about the sale to Sevco 5088 Ltd. 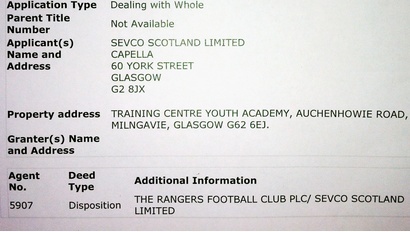 There was some speculation that Sevco 5088 Ltd might have transferred the title of the fixed assets to Sevco Scotland Ltd, However the STV documents, shown below, make it clear that the disposition, or deed transferring title, was granted by Rangers Football Club PLC in favour of Sevco Scotland Ltd.
Sevco Scotland applying for title to Ibrox. But where is this EDMINSTON Drive it refers to? Sevco and Murray Park – Or Has Mr Green Got His Way and Changed the Name Already? This suggests to me that the administrators, whilst stating that they had a binding agreement to sell the business and assets to “the Green consortium” and which was made clear to be Sevco 5088 Ltd agreed to sell the fixed assets, which form the vast bulk of the £5.5 million purchase price, to Sevco Scotland Ltd. I do not see how this tallies up with the statement that there was a binding agreement. Or of there was, it was a binding agreement to sell the assets to two different companies, although not stated in the CVA Proposal. Maybe someone will ask D+P or Mr Green, or the grumpy spokesman, when Sevco Scotland Ltd came on the scene. Maybe Sevco 5088 Ltd will sue for breach of contract! There is speculation about close links between Mr Green and D+P via the “Manchester Connection”. With the greatest of respect to the spokesman, no wonder people see shadows, when the administrators have sold the assets to a company not mentioned in the CVA proposal, nor indeed at the creditors’ meeting. I will write soon about what the point of splitting the assets is, and where the asset sale leaves Sevco. ……. and why are the Players declining to transfer their contracts to Sevco 5088 when Green claims that the club exists with Sevco Scotland? Pedantic much? You know exactly what he meant. The statement is correct. The Rangers Football Club is just an alias he’s using. There is some deliberate obfuscation and slight of hand going on. Normally this sort of chicanery is done behind a curtain but, with the world looking on, the machinations of The Great Oz just look peculiar and – well – shadowy. The detail (and thus the pedantry) is to be found in the details. More power to the pedants (aka Internet Bampots) elbows…! Though we look forward to Paul’s further analysis on this development, many seasoned observers of these matters may suspect that they well know the purpose of splitting the assets and the liabilities. They may feel that it fails to guarantee the prospect of football at Ibrox in future. Paul – just a small point. It’s not unknown for a seller (“A”) of heritable property to conclude missives with a purchaser (“B”), but for the missives to provide that the disposition is to be in favour of another party. In normal circumstances, I can’t see anything wrong with that. Even in this case, is it not possible that title has been taken in name of Sevco Scotland Limited rather than Sevco 5088 Limited to avoid a further disposition from ‘5088’ to ‘Scotland’? I suspect the real question is whether the remaining assets ‘stay’ with ‘5088’, or, in fact, are ALL going to ‘Scotland’. Call me credulous, but it MIGHT be because ‘5088’ is an English-registered company, whereas ‘Scotland’ is a Scottish-registered one – perhaps Mr G might think it better to have his new organisation ‘fully’ Scottish-registered! However, I remain to be corrected! Absolutely spot on. These sort of asset sale agreements invariably state that the seller will dispone title to the purchaser or such other party as the purchaser may nominate. Frequently a purchaser may not have sorted out its precise corporate structure by the time it needs to conclude a binding contract, so this clause gives the purchaser flexibility. I would suggest that any competent corporate lawyer that did not draft the agreement accordingly would have been negligent. It also saves on stamp duty being paid twice, once on the transfer by Rangers (IA) to Sevco 588 and once from Sevco 588 to Sevco Scotland. I suspect that everyone is getting worked up over nothing. Having said that, if it was my intention (or indeed if there was even a possibility) that I would be selling on the property in question to a third party in the immediate future, I would still ensure that the asset sale agreement made this provision. That may be OK if the purchaser is in total control of both entities. I think in this case the issue is that there is a claim that Sevco 5088 and Sevco Scotland were owned by different people. Surely a competent lawyer would have not allowed such a potential situation. No, I disagree. Normally the purchaser’s lawyer would ensure that the title to the assets could be disponed to any third party nominated by the purchaser. That is to also to ensure that if the purchaser subsequently flips the assets, there will not be two lots of stamp duty land tax or any other transaction taxes payable, only one. From the seller’s point of view, the contractual obligation to pay the price etc etc will still rest with purchaser, and it is immaterial to the seller who controls each of the two parties. I see from the STV story that Ibrox and the training ground have been transferred to Sevco Scotland Ltd but which entity holds the players contracts as I don’t think we can just assume it is Sevco Scotland Ltd. The players have all objected to joining Sevco 5088 which suggests that the assets and costs are in different companies. I agree with Greg72, not uncommon for an agreement to allow for another party to conclude the transaction as nominated by the purchasing party. I think that is why legally the involvement of Sevco Scotland is probably ok, despite what has been reported and what Green, D&P etc have themselves said. That said, Green is all the time adding to the confusion by not be clear about his intentions, his funding and his associates, so its not in the least bit surprising that the “ignorant” media and others who are better informed are picking holes in every move and statement. I’m no defender of Charles Green, but in this instance, I suspect the inability of D&P and Sevco (and its variants) to communicate clearly has caused this confusion and there’s actually nothing untoward going on here. I also suspect this confusion has caused the media to report things in a certain way, eg, STV saying Sevco 5088 would be renamed The Rangers Football Club. I would not be surprised if the actual statement was that Sevco would be renamed that and, without any knowledge, at that time, of Sevco Scotland, the reported perhaps incorrectly filled in the gaps. So, I do think there’s a lot going on that Green is not letting on, but I don’t believe this is one of them. What is important here is that Sevco 5088 and Sevco Scotland are 2 different entities & this issue cannot be explained away as simple confusion; there is a lot of deliberate obfuscation going on which leaves things up in the air re player contracts etc. As Paul says, who is threatening to sue players & their agents? It’s a bit hard to defend an action when you don’t even know who is suing you. Paul, not being a legal, but having experienced an insolvency event with my old company and a newco, I am very aware of the importance of the dotted i’s and crossed t’s. So here we have two different entities, a trading name (The Rangers Football Club) and £5.5M. Who paid the money, who bought what? If Sevco 5088 paid for the assets, but Sevco Scotland are getting Ibrox and Murray Park directly from Rangers PLC, presumably there is a record of Sevco Scotland having paid for these assets to 5088, as D&P Rangers PLC can’t just transfer assets to another company? Is there not a requirement in such a case that the purchaser (Sevco Scotland) must have paid fair market value for these assets to 5088, or the sale can be challenge as not legitimate? The only instance where that isn’t required is where we are dealing with a group of companies under one ownership umbrella surely? Sorry, if not making any sense, but the whole Rangers saga is enough to make your brain bleed! Given the history it is not surprising that people are looking for ulterior motives when they hear or read one thing only for it to be contradicted. The easy way to stop the speculation and suspicion would be to tell the truth, but that wouldn’t suit those who are trying to wring money out of this situation. The corporate structure is becoming quite complex. Unravelling intra company transactions can be very time consuming and costly, in whose interests would that be? Not the creditors of RFC (ia) or the fans for sure. Surely only a matter of time before the dandy Sardine takes over from soon to do ‘walking away’ fat Sally as the prospects of playing anywhere diminish by the hour and even Third Division will be out of their reach. Even the clubs in the SFL can see through them and will I believe, vote against them when given the chance. presume Sevco 5088 never actually took registered title, but had a contractual right to the title and therefore were able to nominate sevco (scotland) as the party to take registered title, as others have said above. it looks as though this was a sub-sale to avoid SDLT being due on the transfer of assets from Sevco 5088 to Sevco Scotland. Normal, but it would be so much easier to have said that 5088 exchanged contracts but Scotland completed. All a bit unnecessary really and should have been addressed by a simple statement at the outset from Mr Green explaining what was going to happen. You would think given the intense spotlight that they would be dotting the Is and crossing the Ts in every statement. The question that hasn’t been answered as far as I can see is which company does Mr Green think the players contracts TUPE across to? Is it Sevco 5088 Ltd or Sevco Scotland Ltd? The reason this is important is that if it is the former then the assets have already been separated from any ongoing liabilities. This would then raise the further question of what did Sevco Scotland pay Sevco 5088 for these assets? Of course I am sure there is a simple explanation for this, which will no doubt be forthcoming (along with the names of all the investors). is it not common for a purchaser to make an offer in the name of a particular Company or its nominee with the eventual owner often a different company from that in whose name the original offer came? Gut instinct, rather than knowledge of the law, tells me something is not right here (my gut is far bigger than my legal expertise). I actually take “Kurt’s” basic point that the use of the name “Rangers” in statements on the “Rangers” website, is simple shorthand, given the non-legal-minded audience for which such statements are written. My concern is non-legal, too. I came across the “Sevco statement” on the club’s website before reading the STV story to which it referred. So I expected some Mark Daly-esque revelation (Craig Whyte’s name sprung to mind again, or Charles Green coming out as a woman trapped inside a man’s body). The Court of Session has already made it clear that words in agreements or regulations are taken to mean what they say.The careless use of company names all through this saga is either deliberate or an indication of the intellgence of those involved. So Duff and Duffer were in on the scam, I can’t wait to see what the mighty Craig Whyte has on those dodgy characters. Once their role in the fraud is unveiled, the doo doo is going to hit the fan! Mr Green looked really on the ropes last night on STV. Mo answer to the Manchester United or the cowboys pie in the sky. Looked like he needed the toilet badly. Talk about shitting yourself on TV! I see the same reaction from the Sevco support on one of their forums, attacking STV and the reporter! It beggers believe how stupid these people are! The very minute any news source reports on something they don’t want to believe they just attack the messenger! The world an it wife knew CG was CW puppet. Mr green now says he double crossed CW to get control of the assets! That is the same guy that only 4 months ago was asking people to buy shares in a club that was in the lowest league in Scotland. I do believe any big invester will be looking to get their money back as soon as possible. If a guy tells you out straight I lie cheated and double crossed to get this business I don’t think it’s the kind of guy I would trust with my money.